It’s already November! And a cold autumn is finally here… and yes, winter is coming. Time to rely on some warming and nutritious comfort foods to keep us warm and healthy as the days get colder. 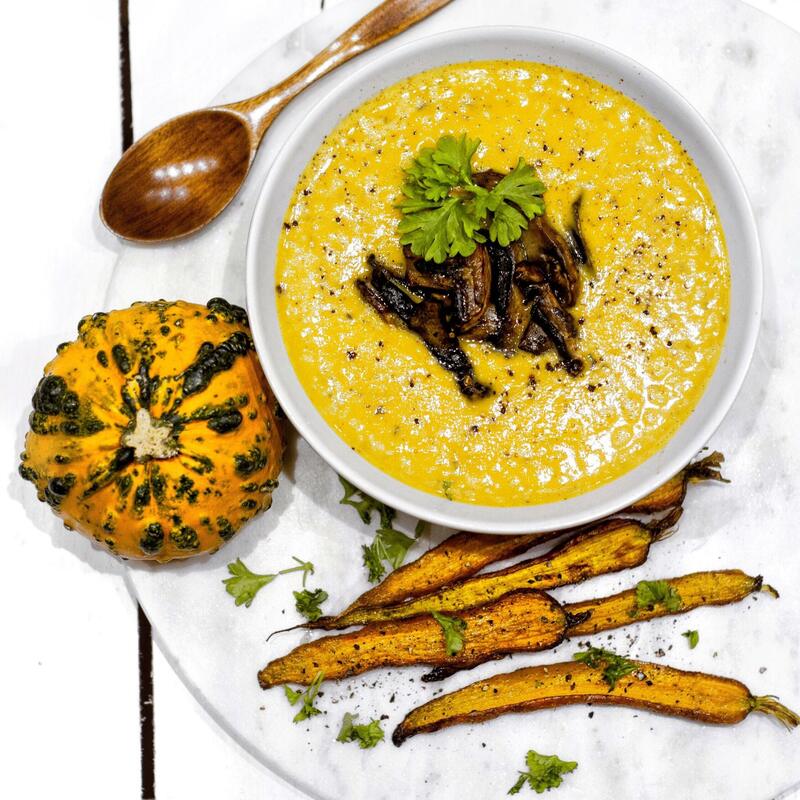 For this autumn I have decided to experiment with some pumpkin recipes – and so far this soup is my clear favourite: Creamy, warming, and the perfect mix of sweet and savoury! 1. Chop the onion and add to a large saucepan with a little oil. Let the onion simmer on medium heat with a closed lid. 2. Peel the pumpkin and remove the seeds. Cut the pumpkin into medium-sized cubes, and add the cubes to the onions. Repeat the with the sweet potatoes. 3. Season with a little salt and pepper and leave to shortly fry before pouring in the broth. Cook the pumpkin/sweet potato mix for about 20 minutes before adding the can of coconut milk. 4. Season with salt, pepper, 1 tsp thyme, ½ tsp nutmeg and ½ tsp rosemary and cook the mixture for another 15 minutes. 5. Transfer to a large blender and mix until the consistency becomes creamy. If you do not have a big mixer, you can also use an immersion blender. 6. Cut the mushrooms into small slices and fry with a little oil, salt and pepper in a small pan. 7. Serve the soup in a small bowl and top with 1-2 tbsp of the mushrooms. Add a tiny amount of cayenne pepper – and you are ready!